While out trying to find thank you cards in WHSmiths my husband spotted this new Crochet title and as it was only 99p I thought it worth getting a copy to review for you all. The 'hook' (he he!) for this part work is making a crochet throw with a new ball of yarn each week, and at 120 squares in the throw you'll be buying this partwork for over 2 years before you've finished. The yarn you get is only a 26g ball - enough to make your square but very little else. At the full weekly price of £2.99 it really doesn't seem worth getting as the content to the partwork seems pretty basic with some not very original patterns, a new stitch each week and a quick page with tips and tricks. The first issue is there to pull you in with a DVD that shows you the very basics (useful for visual learners - but remember there are loads of crochet videos online that are just as good), the two small balls of yarn (the practice ball of yarn is even smaller at only 6g! ), a metal 4mm hook and the instructions for a scarf, some cushion covers and a mesh pattern top. This isn't something I am going to buy again, and I'm slightly disappointed by how little you get as I worry that it will turn potential new crocheters away from a fantastic craft. 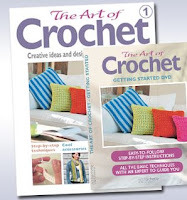 If you want to learn to crochet there are lots of other ways to begin with loads of free resources on the web as well as some beautifully written books for beginners. This partwork is a very overpriced way of doing it and really doesn't offer anything special to help you.